I mentioned in my first post that I searched wedding blogs for inspiration, DIY ideas and color schemes. Style Me Pretty is one of my all-time favorite blogs. It was certainly helpful as I started my own planning process! 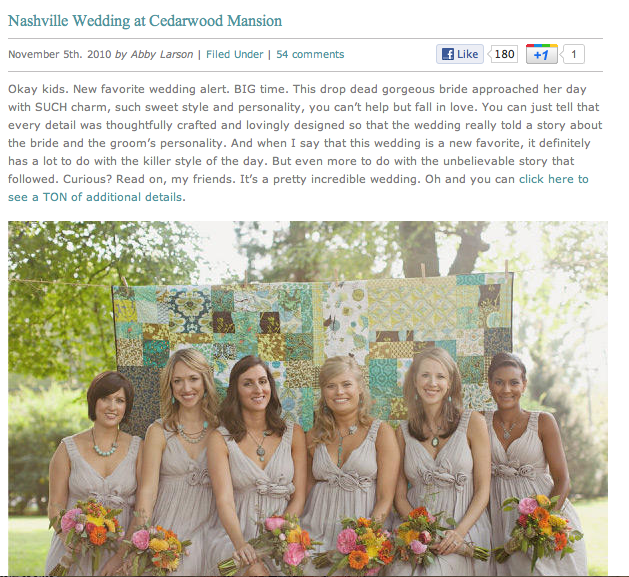 With that said, I am so very THRILLED to announce that our wedding was featured on Style Me Pretty yesterday!!! Please check it out and keep reading blogs to help you plan your special day! My sister and I have been dreaming of birdcage centerpieces for my wedding for the past year now and have yet to see anyone else really do it, so when trying to explain our vision to anyone, it's been difficult...then I just saw your wedding on StyleMePretty. Where did you find your birdcages? Especially the big white one? If you can let me know as soon as possible I would greatly appreciate as my sister and I are trying to lock down my florist budget and would really like to find reasonably priced birdcages. Thanks!